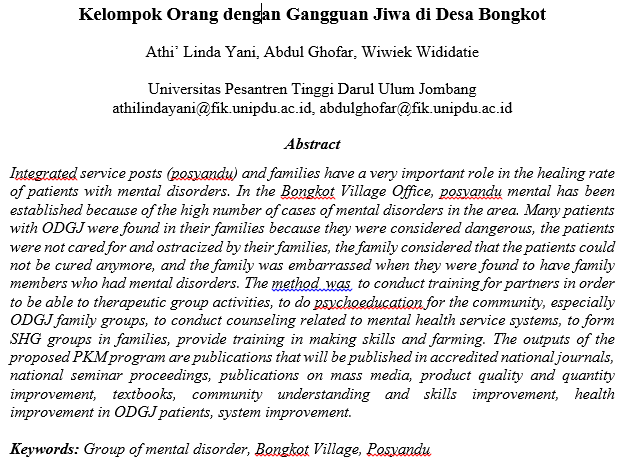 Integrated service posts (posyandu) and families have a very important role in the healing rate of patients with mental disorders. In the Bongkot Village Office, posyandu mental has been established because of the high number of cases of mental disorders in the area. Many patients with ODGJ were found in their families because they were considered dangerous, the patients were not cared for, were ostracized by their families, the family considered that the patients could not be cured anymore and the family was embarrassed when they were found to have family members who had mental disorders. The method given is to conduct training for partners in order to be able to therapeutic group activities, to do psychoeducation for the community, especially ODGJ family groups, to conduct counseling related to mental health service systems, to form SHG groups in families, provide training in making skills and farming. The outputs of the proposed PKM program are publications that will be published in accredited national journals, national seminar proceedings, publications on mass media, product quality and quantity improvement, textbooks, community understanding and skills improvement, health improvement in ODGJ patients, system improvement.